As a lifelong fan of both collegiate and pro sports, I’ve found that the rules of fan conduct vary more at a track meet than perhaps any other sport. I grew up learning to bait opposing players and, at eleven years old, had the “honor” of getting flipped off by Bob Ferry, then a journeyman NBA forward, when I suggested that the poor foul shooter come off the bench and give the crowd a free throw shooting exhibition. And once, during a ’60s hockey game, Stan Mikita of the Blackhawks got so annoyed with the taunting of a friend and I that he skated over and slammed his stick into the glass where we were sitting. 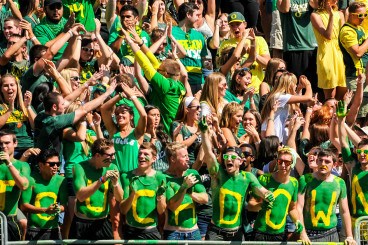 While not every fan practices the art of baiting opposing players, few fans hesitate to cheer when opposing teams fail and the din at places like Autzen when the opposing team has the ball is generated to cause as much anxiety as possible for the opponent. 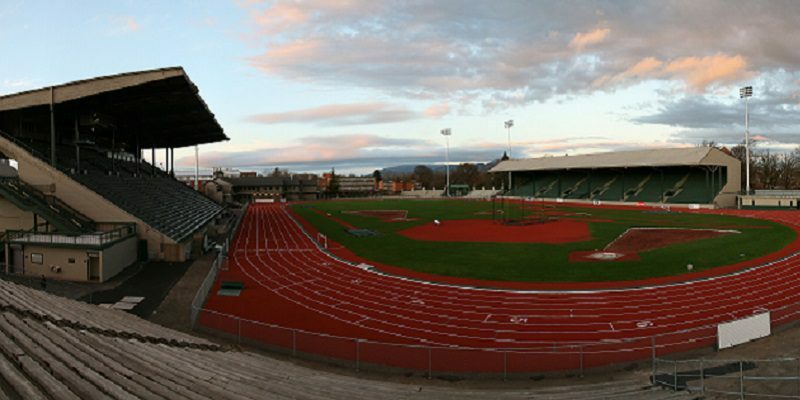 The always popular Hayward Field. 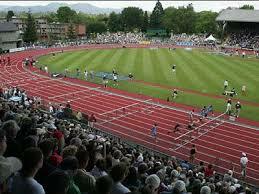 Fast forward to a track meet at Hayward (or almost any other track facility in the World). A track purist is happy to wish the opposition well and is almost never seen booing an opponent; in fact, great performances by opponents are met with cheers (picture a great catch by a Stanford receiver late in the 4th quarter of a close game and the crowd reaction which is often stunned silence). Perhaps it’s the nature of a sport where the home team is unable to play defense against an opponent. The closest thing to defense in a track meet might be a bit of jostling during distance races while trying to protect one’s position and minimize the distance to be run by guarding the inside lane ; while it’s not considered good sportsmanship, teams sometimes set up human barriers designed to force the opponent to run extra steps to pass a roadblock of opposing teammates. Perhaps a few head games are played by some athletes before and during the competition, but they hardly represent the equivalent of a linebacker lowering the boom on an opposing receiver or a hoopster low bridging or clotheslining an opponent driving to the basket. Does this make track fans a group of intellectual elitists who won’t lower themselves to behave like football or basketball fans? I think not. Most everyone I know at Hayward can be found at Autzen or Matt Knight cheering the home team, booing opponents and applauding opponent mistakes. Duck fans are loud and proud. I’ll readily admit to quietly hoping Duck track opponents will have a bad day and loudly rooting for athletes on teams which aren’t competitive in the team races to upset athletes whose scores might adversely affect Duck chances of winning the team battles. I’m not alone. The difference is that much rooting against opponents is done within while the tradition of genteel behavior at a track meet is maintained. One large advantage in attending a track meet is that you’ll never hear profanity or have to ask security to eject a nearby unruly fan. Fistfights are unheard of. Drinking before and during a meet is mostly unknown or at least limited to minor amounts, though local watering holes will fill up after a meet as fans discuss the events of the day. Perhaps the best part of attending track meets is fan interaction with the performers. As a niche sport, athletes don’t face the day to day scrutiny as do famous athletes in other sports. As a result, most track athletes are happy to sign autographs and engage in conversation with fans. I can freely chat with a World Record holder or Olympic champion while the guy sitting at the end of a major league bench might arrogantly brush off a little kid looking for an autograph. While track fans may not taunt opponents or loudly wish them poor performances, we Duck fans are quite happy to blow the roof off of Hayward when our Ducks come running towards the finish line in a tight race. Ultimately, all the joys of watching any Duck sport are realized at Hayward while minimizing some of the distasteful fan behavior exhibited at other venues.